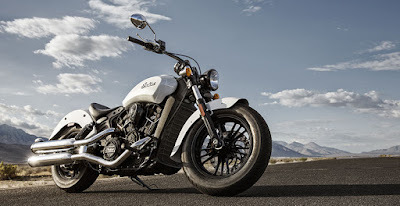 On a cloudy stormy day I headed out on the tarmac to meet the Indian Scout Sixty for a test ride. I had been looking forward to test riding this moto for sometime now, and a little rain was not going to deter me from accomplishing my goal of the day. I know what you may be thinking, aren't you a sport tourer? a sport bike type? Well, No. I am a motorcyclist and by an unofficial definition one who admires motos. And that is how I decided that I must test ride the Scout. First, I will start by saying that I was impressed by this moto. It's craftsmanship and image is astonishing. Beautiful sparkling white paint, adorned by wide fat tires and black-out engine and wheels, complimented by a relaxed geometry that beckons the open road. As a former Sportster owner I can attest that this moto blows the Sporty off its Iron pedestal! The look, the power (78 hp), the torque down low, the smooth engine, the liquid cooled factor, it all overwhelmed the aforementioned all American from Milwaukee . After about 20 miles of tooling around on this bike I can only find four flaws and those are: the clutch requires a strong pull that is less than ideal for city commuting, what happened to ABS and where is the fuel gauge?? Really? If I am going cross-country on this beast I'd like to know how much fuel is in the tank. And lastly, accessories for this moto will leave a serious dent on your wallet. Minor details, not a deal breaker since once you look at this moto in person all you want to do is ride it! This is an excellent specimen of cruiser style moto, simplistic, stylish and functional. One that would make a superb addition to anyone's stable.